Happy Wednesday! How are you surviving the week? It has been gloomy here (you know rainy and even a little snowy). I'm not complaining, I actually love this cold front we are having but it has gotten me thinking about the bright sunny days of spring (that and the fact that I just bought our tickets for a beach getaway in the Spring). So, here are some fabulous yellow beauties to brighten your day. The lamps need no introduction. They will illuminate with gorgeousness any corner in your home. And this duck mirror you ask? I received this random catalogue today and because I must flip through each and every catalogue before throwing them out (to your benefit of course!) I discovered this cutie of a mirror. It would add the perfect touch of quirky to your vanity ( plus its gold, so we agree we all love it). Now, about this Alexander McQueen bag... I know I have featured this same style bag (but with a floral print) previously here, but I have the need to re-state the fact that this bag is too good. How do I know? My mom actually got it for herself and it is amazing in person. TRUST. And well with this dragonfly print and color palette it is pretty snazzy. And lastly, of course, we have the cool chic shoes because you better believe once you put these on you can just add major degrees of coolness to your outfit. So you see? This yellow is not at all mellow. I have to admit that even though I'm gong through an anti yellow phase in my life right now, all of these are amazing. Those lamps are everything to me! I'm going to toss in some love for that quirky footed mirror. I have a niece, whom I affectionately call "bird" and we're currently in the process of updating her bedroom. I can't help but think this would be perfect sitting on her dresser, with all her little necklaces about. Fun round up Albertina! I love yellow, and I know you do too! It really does brighten my day. It has been rainy all week here and Im really getting sick of it. Here's hoping for some sunshine in real life, but in the meantime blogs are providing so many lovely things to look at! That footed mirror is so amazing! Love love love! Thank you for this little sunshine!!! We definitley need that! Anyway, these lamps are very beautiful and the prints on the bag is gorgeous! These yellow pieces are great! I want those lamps and that mirror...so unique! I'm seriously loving that mirror! So unexpected, and it's gold! What's better? Those shoes would be so much fun to wear!! Now if it would just warm up outside! Your mom is the most stylish mom I know! Wow! Love the bag! But I hate this cold weather! I need warmth, always! I have to agree with everyone...Those lamps are to die for! Love the yellow in them but they would also look great in any other colors...I just love the 70's look! The clutch is amazing! You need to borrow it from mom! 1)lijar..2) latex extracubriente buena marca BEHRcon brocha 3)con huipe latex estra opaco(no me gusta el brillo).Yo en general no lijo mucho , me carga uso esa pintura que es extracubriente. I absolutely love the metal shades on the lamps! It looks happy! The weather herehas been dreary, but I'm going to be longing for it this summer! 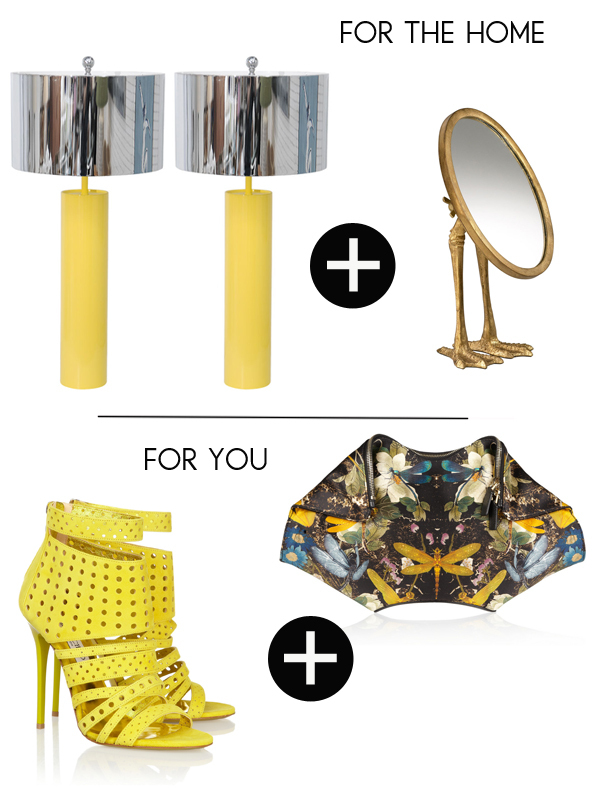 Ah, these pops of yellow are just what I needed today! I'm wishing for warm weather & sunshine pronto! Oh yes...I'll take one of each!